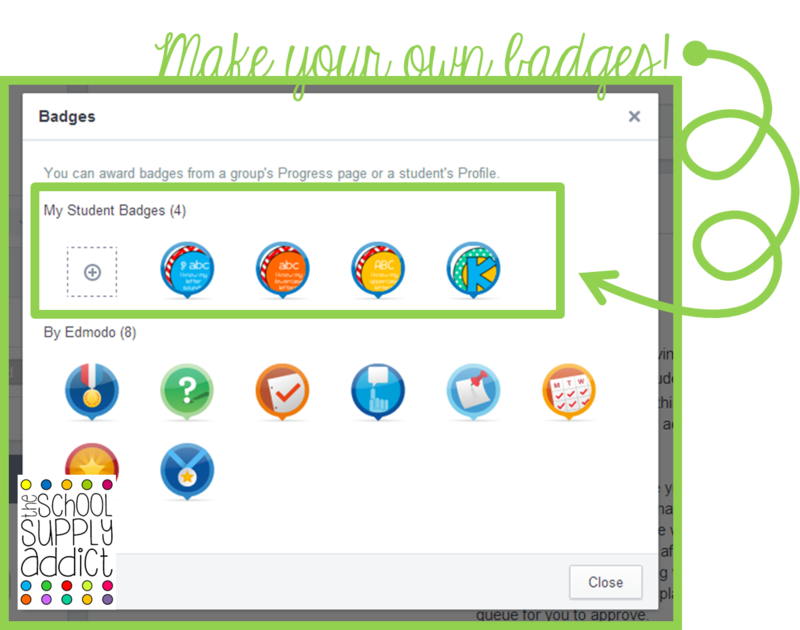 Blog Hoppin': Using Edmodo Badges for Tracking Student Goals... In Kindergarten! Using Edmodo Badges for Tracking Student Goals... In Kindergarten! Hey everyone! It's Ashley, The School Supply Addict! I hope you are getting a great start to the school year... or enjoying your last bit of summer! Today I wanted to share a little bit of what I'll be utilizing this year with my kindergarteners. This year, we are jumping into data binders, student led goal and data monitoring, etc. At first I was a little skeptical about it working well in kinder, but after visiting some other schools with a team of colleagues, we are pumped. Yes, nerd alert. We are pumped about data binders! Here's a little bit of how it will be laid out in my room. Set Goals: (learning goals, personal goals, and class goals) These can be anything from learning letter sounds to increasing our reading stamina by 10 minutes to sitting on the carpet for an entire lesson without nose picking. Obviously, goals will vary based on each child's needs. Edmodo Badges: Each of my students has an Edmodo account. Sounds a little ambitious for K, right? We are just getting started with it and the parents are pretty excited! We don't utilize it in the same way (or frequency) that a high school class would, but we make it work for us. Baby steps. Edmodo has a feature where you can award badges to students. There are badges for things like homework, attendance, hard work, etc. There is ALSO a feature that allows you to create your own badge for whatever you want it to be. I have been making a lot that will coincide with the various skills that our little friends will master throughout the year. That #2 above? Whenever a student achieves a goal and tracks it in their binder, they will receive a digital badge! We don't start until this Wednesday, but I sent a badge out to students who have already joined our Edmodo group.... and oh my y'all! They're obsessed. I do, however, want to show you how to make your own badges. It's SUPER easy. All you need is PowerPoint (or similar program), some fun digital papers, clipart, and time. This little tutorial is for PowerPoint, but there are similar steps for other programs. Screenshot of some of the badges I have in my Account. Play with the settings of the circle: add a thick border, fill it with a digital paper or color, etc. Select ALL the elements by pressing CTRL+A. Right click and "Goup" them together. You can also just use CTRL+G to do it. Right click your creation again and select "Save As Picture"
Save it however you want! It will be saved as an image and you can then upload it to Edmodo via your Badge manager. Finally, they're ready to be awarded! Dish them out as your kids reach their goals... and watch them become little badge kleptomaniacs. Haha! They LOVE getting them and showing off what they've accomplished. Easy peasy, right? You can make as many as you need. I've got a long list of badges to make for this year, but the kiddos love it! One thing I've found helpful is to make similar badges the same color. All of my ELA's have a red chevron background, science is green, writing is yellow, etc. I hope this was helpful for anyone who uses Edmodo or is interested in getting started! It's an amazing tool to get your kids engaged outside of class, build relationships, share content, receive feedback, and track progress in a fun way. Have a wonderful week Blog Hoppers! This is awesome! I am hoping to use Edmodo with my kindlers. Question. Did parents use their own email to sign up their child? Or do your students have school email accounts? What a fun idea. Our staff uses Edmodo for communication and some of our grades use it with their students. I'm an intervention teacher and I'm excited to see if I can give out badges for reaching goals in intervention. I shared your post on our staff Edmodo page looking for a grade to test out. I Love, Love, Love this plan. Are the binders physical or digital? Do students access them themselves? I would love to see a binder and the tracking sheets. Thanks!